Understanding your Retirement Spending—Yet another reason the 15 minute retirement plan fails. I am continually amazed at the amount of “generic” financial advice that is available to the average surfer of the internet. While some topics discussed can be quite salient, I do believe that others can even be dangerous. Those that tend to overgeneralize about the “Average American” in retirement I find to be particularly problematic. Take a recent article on Motley Fool which suggests that spending budgets tend to significantly decrease during retirement years—and then proceeds to provide dollar amounts for the average costs of certain line items. Here’s a snippet—tell me if it sounds like reality for you? Rather than pick this apart line by line, I will just provide a few examples of what I think are errors in this line of thinking. The budget above may be more than adequate for someone, but it fails to take into account the specifics. Take housing as one example: Many clients may still have mortgage carrying costs in the early transition years of retirement. $1232/month for mortgage, property tax, utilities, & upkeep sounds low for Northern California. Healthcare is another good example. While the article acknowledges that the spending in this category goes up during retirement years, it fails to note how Medicare premiums increase as adjusted gross income increases. I would argue that there is no such thing as a static budget for retirees. 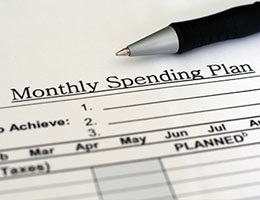 I think the spending activity will change as you go through life. For some people, spending may increase early in retirement because of travel plans (oddly left out of the generic article referenced), but decrease as you age and are more homebound. Taxes are often left out of the considerations when it comes to planning for expenses in retirement. The referenced article simply sums the above monthly expenses and extrapolates that an asset base of $1MM would be plenty based on a 4% withdrawal rate (perhaps another faulty assumption). But many people have saved for retirement in tax-deferred retirement accounts, which have an associated tax cost in accessing them. You may only be able to spend $0.75-0.80 on the dollar, because the remainder goes to taxation (could be more, could be less depending on your situation). I believe these considerations are left out of the generic financial articles because the tax code tends to be confusing and voluminous. This leaves one solution—take the time to build an INTEGRATED financial plan before taking the leap. Understand your spending, how taxes fit into the puzzle, and how to structure your net worth to fit your plan.